Congratulations PodCacher on 600 episodes! Since 2004 Sonny and Sandy have been geocaching together and traveling the world. What began as a first date became a hobby they would love and share together. A year and a half later the PodCacher podcast was born. Their charming personalities, engaging content, and consistency make the show entertaining for geocachers of all ages and levels of experience. The podcast has grown to be the largest and most internationally-recognized geocaching audio show in the world. Earning nominations for “Best Produced Podcast” by the Podcast Awards and has been a featured podcast in Apple iTunes for many years. 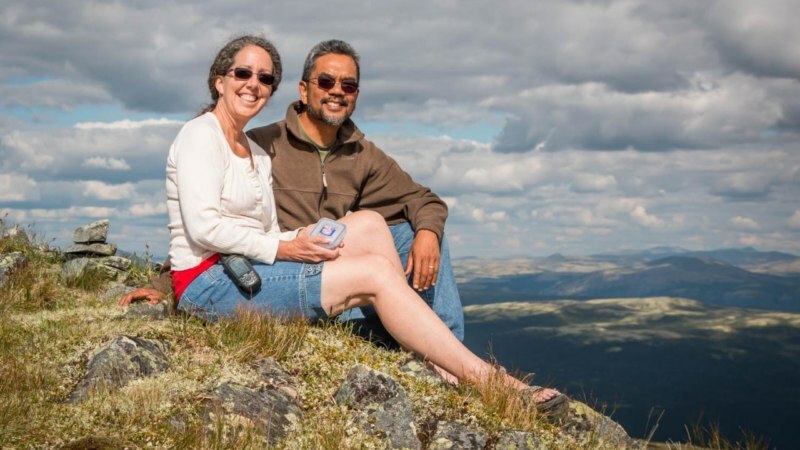 As part of celebrating PodCacher’s milestone of 600 episodes, I interviewed Sonny and Sandy to learn more about how they got started and who they are outside of geocaching. 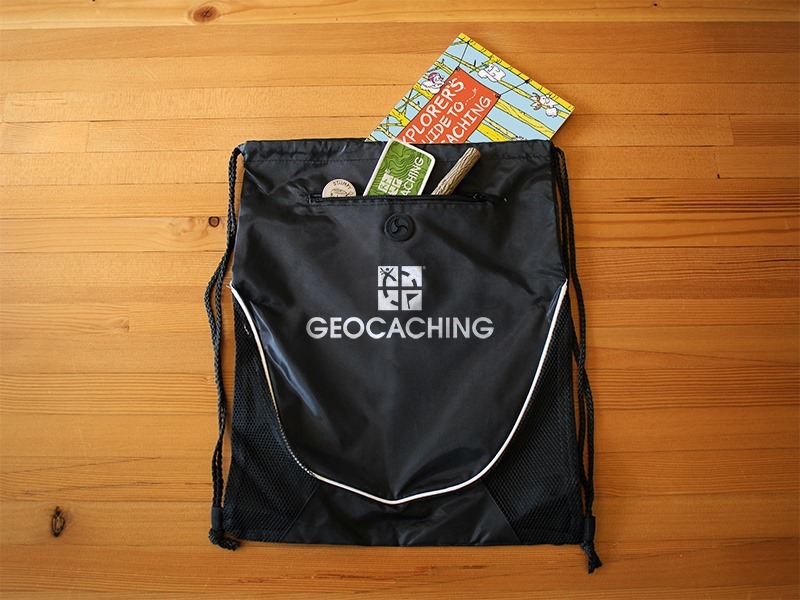 For most of us, geocaching is a hobby—a way to get outside and explore the world around us. To Stanley Polley, a 4th and 7th grade science teacher at the Loveland Classical School, geocaching is much more than that. 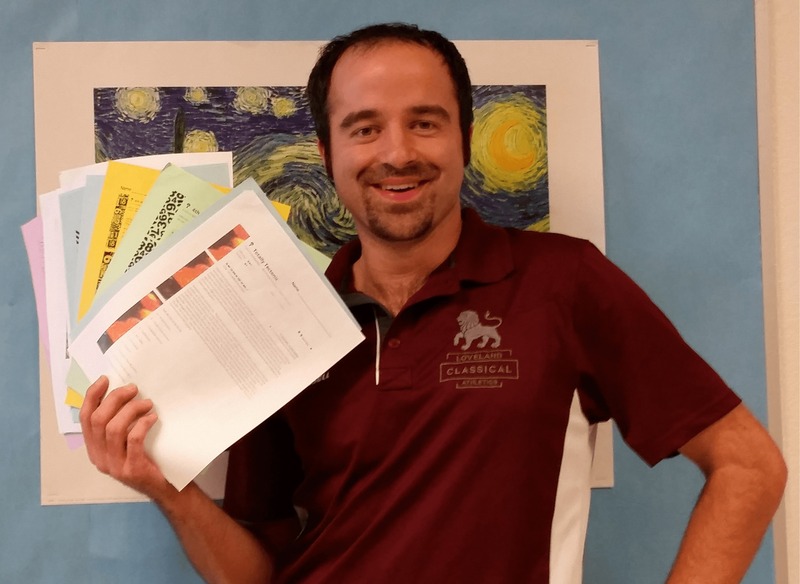 Two years ago, he began to teach geocaching—most notably Mystery caches—in his classroom as a way to engage and inspire his students. He soon discovered, that “Educaching” was not only a hit with the kids, but a great educational tool as well. Dr. Polley let us pick his brain about how he brings geocaching into the classroom. This is what we learned. What inspired you to start a geocaching program with your students? The first time I used geocaching in the classroom was two years ago, teaching 6th graders about constellations and the life cycle of stars. Our class sent out 4 Travel Bugs, and as they moved, students used online resources to determine what constellation would be visible at night from the exact coordinates of the geocache each TB was in. Can you walk us through the organization of your geocaching program? I use geocaching in many ways, including an elaborate Classroom Competition and Academic Mystery Caching. Classroom Competition: I split all of my classes into smaller science themed teams, and give students/teams opportunities to earn points. The team with the highest point value at the end of the year enjoys a decadent donut party. 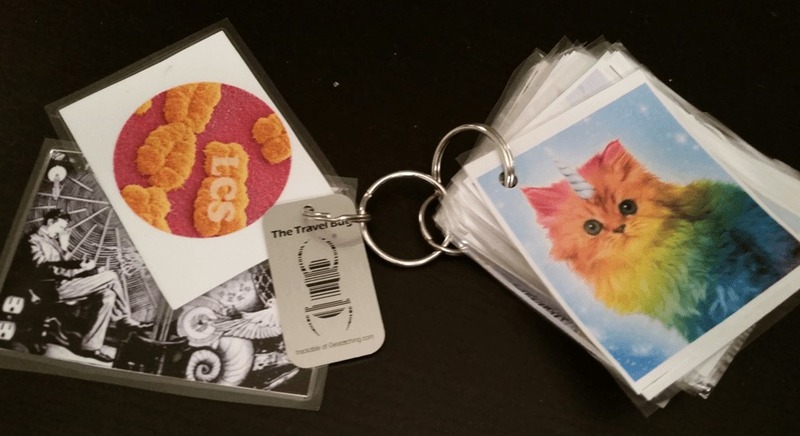 At the start of each year each team creates highly personalized team Geocache and team Travel Bugs. The number of cache finds, pictures logged, and TB miles traveled impact each teams point total. Students can also check-out GPS units to go find our class caches, as well as the 30+ Science/Math/Music Mystery Caches. 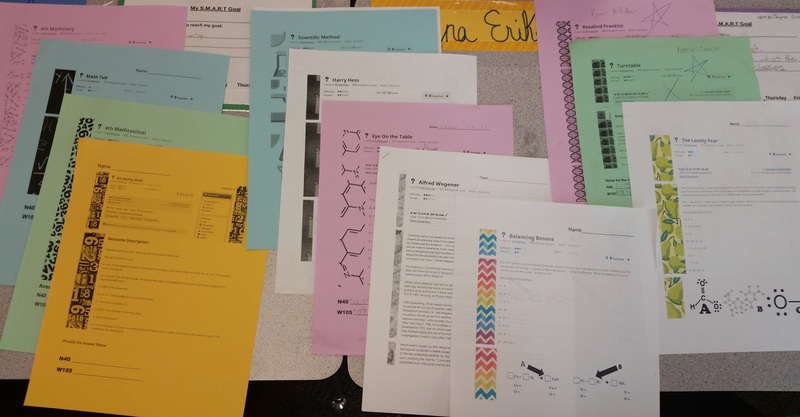 Academic Mystery Caches: Individual students can earn points for their team by solving scientific problems in the form of Mystery caches. There are currently 33 active Mystery Caches. The puzzle caches vary greatly in difficulty so that content can be differentiated for students at different ability levels. Physical copies of each puzzle are available in each classroom as well, so that students without consistent internet access have an opportunity to solve the puzzle and check-out a GPS to find the physical cache. 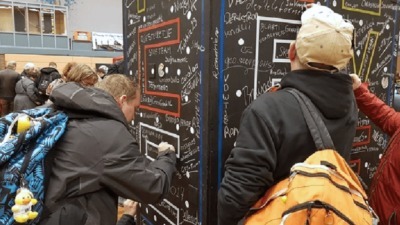 By solving a Mystery Cache, students earn points for their teams regardless of whether they actually go to find the cache at the physical location. These Mystery Cache puzzles are not homework, yet students ask me for new puzzles on a daily basis. In fact, a policy had to be established that they don’t have the physical copies of the puzzles out during other classes. That’s exactly what I want to see, ravenous learners. I have expanded the Mystery Cache curriculum to include puzzles from multiple subjects, including Math, Music, and History. In collaboration with math teacher Lindsay Stahl, we have created dozens of supplemental academic opportunities for students of all different ability levels. Soon a series of caches will be published in collaboration with our Art, Latin, and English faculty. The types of Mystery caches will change through the year to align with the curriculum. What were your biggest challenges when setting up the program? 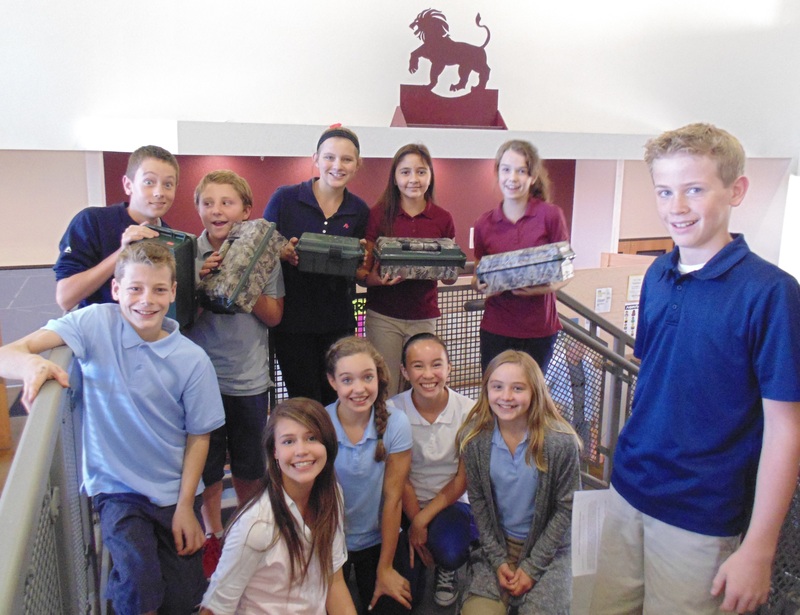 What values do you believe geocaching brings to students? All of my complex science, math, and history puzzles are completely optional. The fact that students love to do these puzzles anyways shows tremendous character and loyalty to their teams. Our school’s motto is “Fallamur ut floreamus,” which means “Let us falter that we may flourish” in Latin. The academic puzzles my students solve require a lot of faltering, which make the flourishing all the sweeter. 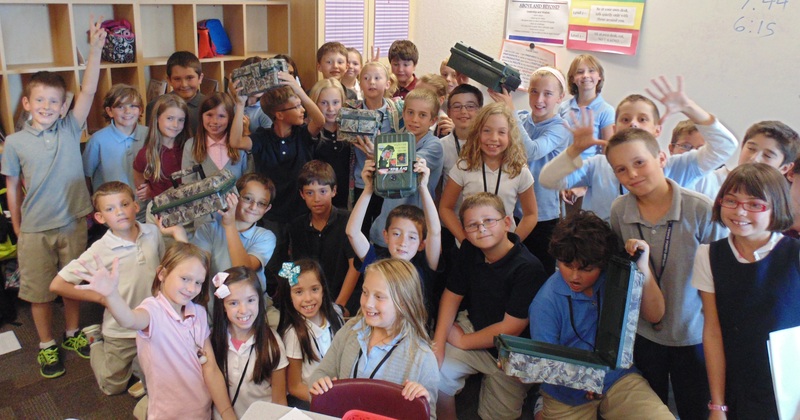 Overall, how have your students reacted to geocaching in the classroom? They seem to love it. It’s awesome to see how excited my students get when I show them new Travel Bug pictures or report a find of their team cache. A handful of students have become fanatics, as a group logging over 1500+ finds, 82 hidden caches, and 35+ new geocaching accounts. What advice can you give to teachers who’d like to set up a similar geocaching program in their classrooms? I would say that it takes a lot of consistency. The reason the classroom competition works is because I start each class with a very brief update on the team scores and any activity for each team’s travel bug, geocaches, and students who solved an Academic Puzzle. You also started a geocaching club at your school. Could you tell us more about it? The geocaching club has been a blast. The club focuses on making and hiding creative caches. The only rule of geocaching club is that the caches they create have to be Mystery Caches, with a puzzle that uses what they are learning from one of their classes. Club members have made Chemistry, Music, and Latin puzzle caches, with many more to come. Soon we will be organizing CITO events to support our community. Dr. Polley geocaches under the usernames MrPolleyClass and The Scarlet Beaver. If you are an educator and have an interest in incorporating geocaching in your classroom, Dr. Polley is a fantastic resource. Feel free to reach out to him through Geocaching.com. And on another note, if you’ve hidden a Mystery cache, know that your geocache description could be circulating around his classroom! Dr. Polley is the best! Geocaching partnered with Diary of a Wimpy Kid author Jeff Kinney to create a fun set of Diary of a Wimpy Kid: The Long Haul trackable tags to celebrate the book’s release last year. 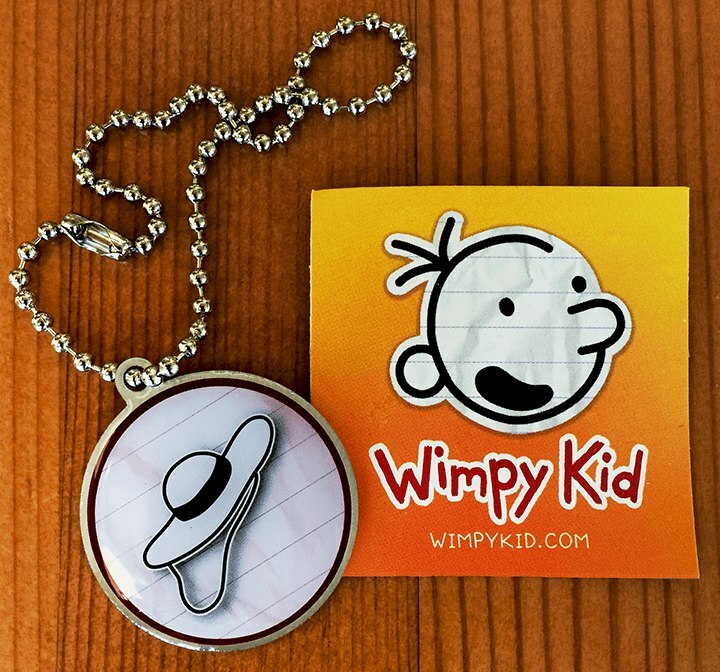 What you may not know is that the Wimpy Kid trackables came about because Jeff Kinney is a geocacher. He enjoys taking his kids out on geocaching adventures. We are thrilled that he wanted to share one of his geocaching experiences with us. If you are following his series, you will be excited to learn that the next book, Diary of a Wimpy Kid: Old School, will be released on November 3, 2015. This book is particularly exciting because it will go on sale on the same day in 90 countries around the world, which has never been done by any book before! Kinney shared one of his geocaching experiences with us, in his own words. 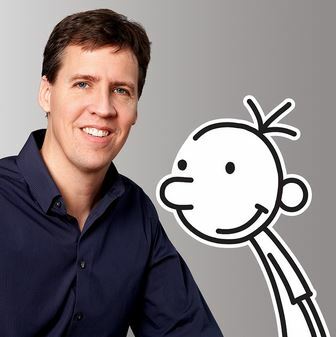 Geocacher and author, Jeff Kinney poses with Greg Heffley from his Diary of a Wimpy Kid series. When I first learned about geocaching a few years back, I was thoroughly confused. People have stored little treasures in hiding places all around me? It seemed like an odd pastime to me. But mysterious and exciting at the same time. I was looking for something fun (and cheap) to do with my two sons. And so I downloaded the Geocaching app. I was ready to head off into the wilderness some miles away, armed with a walking stick and an iPhone, braving ticks and scrambling over felled trees. But as a swarm of blue dots filled the map on my screen, I was surprised (alarmed?) to find that there was a hidden treasure not 200 yards from the back of my house. Now this was exciting. I made sure my kids had adequate footwear and we headed out, stepping from the verdant grass of our backyard into actual raw nature. There was some scrambling and some hopping over creeks formed by snow melt runoff. There was some negotiating of brambles. There may have even been some burs. I’ll admit, I’m not exactly the outdoor type, so the thrill of forging my way through the wild… with two of my progeny in tow… had the feeling of real danger. Eventually, we reached a clearing where power lines cut through the woods (OK, so maybe it wasn’t raw nature). By now, we were getting close. The pulsing blue dot was nearby, but where could the hiding spot be? These were early days of GPS pinpointing, and the dot hopped madly around the screen. It seemed that our quarry was on the move, taunting us. I was waiting for the dot to stop. Then we’d creep up on it, look down, and find the treasure at our feet. My kids must’ve detected the confusion on my face. This was a strange ordeal for them to begin with, so the sight of me spinning in place and shaking my iPhone violently didn’t give them a feeling of confidence. But then I realized I needed to start thinking like the first person who had decided that this was the place to hide a cache. I gave up on the teleporting dot on my phone and started using my eyes. My eyes fell to a fallen tree. It was all starting to come together. But where was the cache? Under the tree? Oh no! Did someone place a cache in this spot and a tree fell on it? This was going to be very hard to explain to my sons. By then, my eldest son had climbed over the tree to investigate it from a different angle. And that’s when he found it. A plastic box, hidden in a hole in the log. A real eureka moment. Inside the box was a giant pencil. A decent treasure for the effort put in. We added our names to the log, proud members of a long list of explorers who had come to the same spot, but from different starting places. Neither of my kids saw me palm a baseball I had brought from home and slip it into the box before putting it back in the fallen tree. I didn’t need the tears. 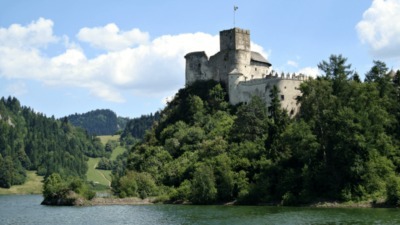 A good bite-sized adventure and one I’ve repeated in locales further from home. I never did teach them how to throw a baseball. They love the exploration, discovery, mystery, treasure and outdoor aspects of this fun hobby. As you plan your geocaching outing with kids, you’re probably thinking of the obvious things to take along like plenty of water, lots of snacks, extra changes of clothes, a first aid kit, etc. You are definitely a well-prepared geocacher. 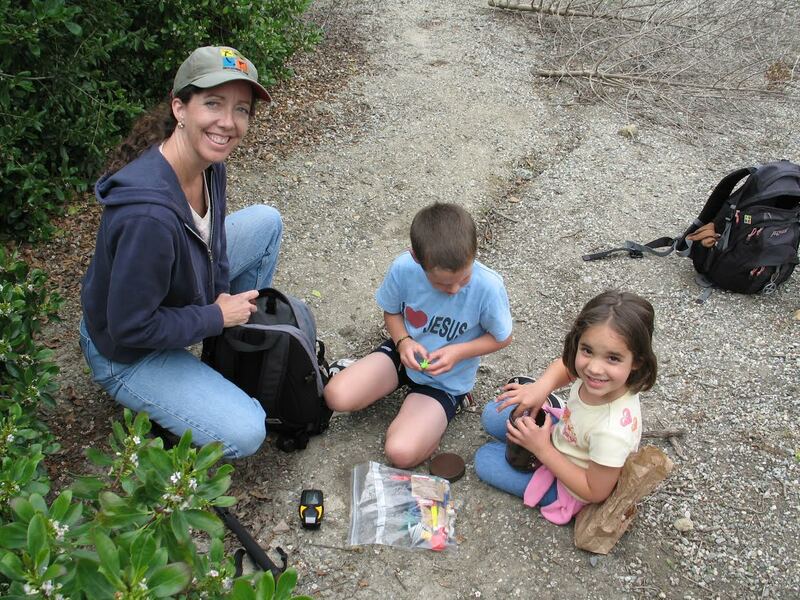 Now, before you head out, here are 3 things to AVOID while geocaching with kids. Kids love to take their time and explore. They aren’t in a hurry to get from point A to point B, especially when there is a lot to see, touch and experience between the points. We could learn a lot from them! 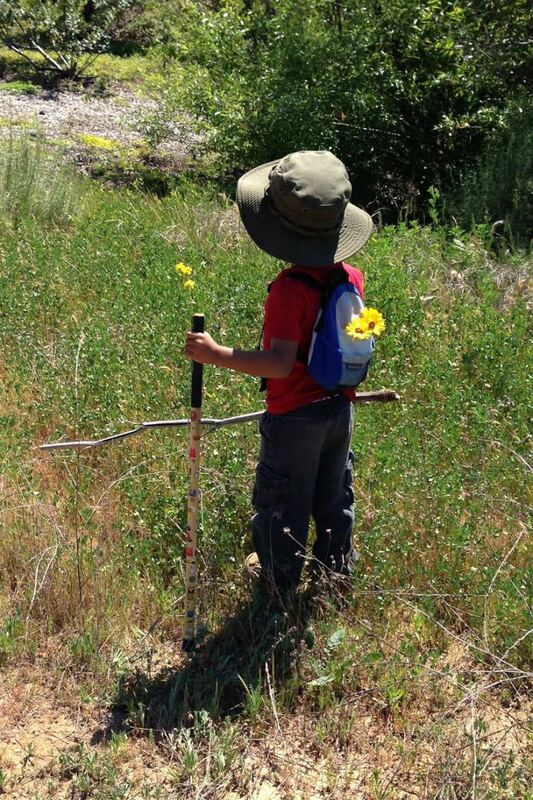 Let the kids take the lead, and see what you can find to savor as you walk to the next geocache. 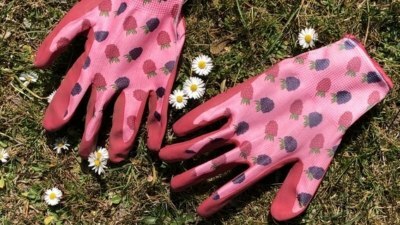 Bring along a bag or bucket to gather nature “treasures” to take home. Take the time to jump from rock to rock (and don’t fall in the make-believe lava!). Don’t try to squeeze in too many caches. Take your cue from the kids regarding when it’s time to call it a day. Some kids might love finding altoids tins under lamp-skirts or on guard rails, but they are in the minority. Kids love toys and swag. The smallest trinket can be the greatest treasure in the eyes of a young child. Don’t deprive them of the fun of swag by only going for the tiny containers. It may be a little more work to find an area to cache in that has larger containers, but if you’re going on an outing with kids, it’s definitely worth the extra effort. Be sure to encourage the kids to bring swag along to trade. You can all stop at the dollar store before heading out to geocache, or they can raid their toy bins at home. Take the time to teach them about “trading even or trading up”. It’s a great lesson to learn at a young age. Resist the urge to orchestrate every aspect of the experience for your kids. Hand over the GPS, or your smartphone (with a sturdy protective case) and let them learn from trial and error. Don’t be the one to find every geocache first. 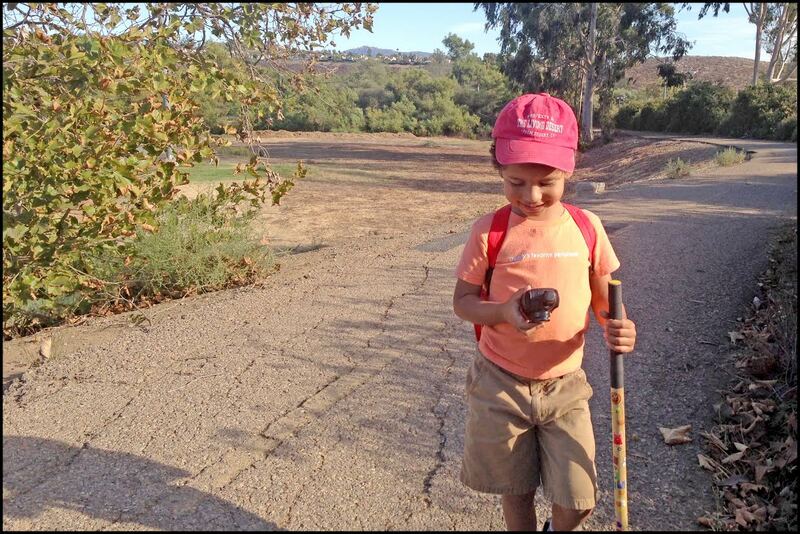 Give younger kids a “nudge” in the right direction so they can enjoy the fun of “finding” the geocache. Let go of your expectations of how the day “should” go, and just enjoy what happens. The kids might be excited to find even more geocaches than you expected OR they could be all done after just a couple. Be okay with heading to a playground to give everyone a break. Help out new geocachers, share you advice for geocaching with kids in the comments below! 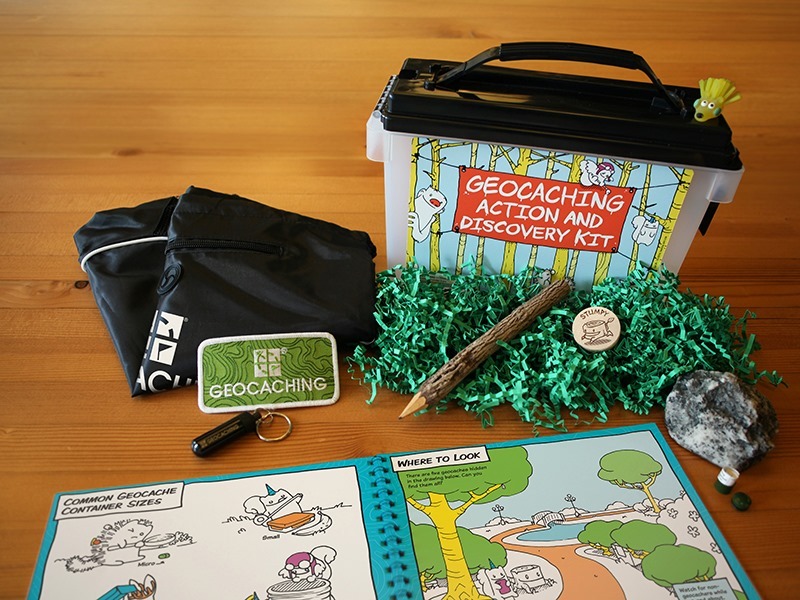 The holidays are approaching and with the Geocaching Action and Discovery kit, you can inspire the spirit of adventure in kids. 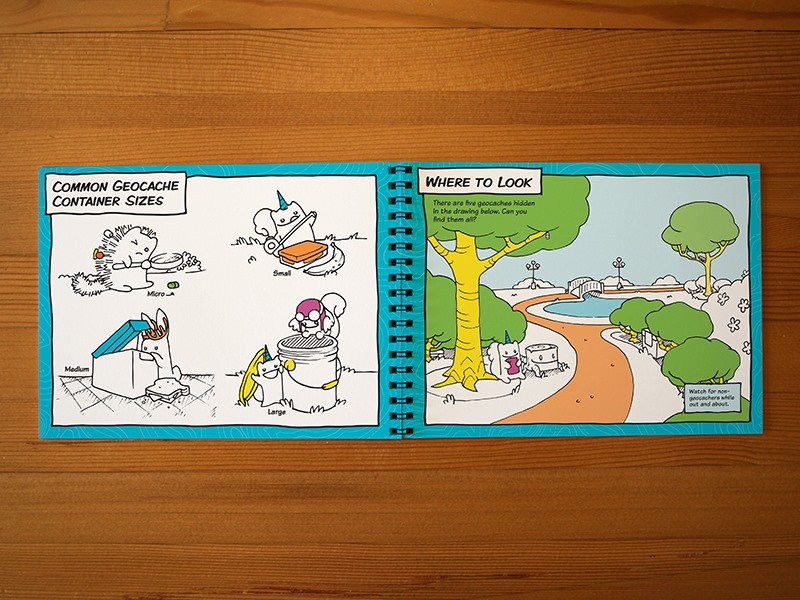 The Explorer’s Guide to Geocaching Activity Book—exclusive to the kit—guides them through the adventure of geocaching with fun characters, over a dozen activities and more. They’ll have everything they need to find their first few geocaches* as well as hide one of their own. Give this kit and unlock millions of adventures around the world. *Download of a free iPhone, Android or Windows Phone app required for outdoor geocaching.